YouTube is responding to gamers and YouTubers who are upset about the Internet video giant's extraordinarily aggressive new copyright sweeps. We've got a a copy of the e-mail they're sending out below. You won't see an apology here. You won't see a change in policy. You'll see support for the Content ID system that's been more broadly unleashed on the reviews, features, Let's Plays and other video pieces created by YouTubers and watched by millions of gamers. Many, many of these videos have been flagged of late, blocking YouTubers from running ads on them and letting the supposed copyright holders to these videos run ads instead. The catch is that many game companies aren't even claiming these videos. In many cases, music licensing companies are, as YouTube's bots catch a piece of matching music—even just a boss battle song or a song playing on the radio in Grand Theft Auto, or sometimes some music licensed for an indie game. You will see a recommendation that YouTubers mute the music in the games they're capturing and you'll see what appears to be support for the idea that a music rightsholder can claim that a YouTuber can't run ads on a gaming video just because the music rightsholder has a claim to a piece of music that might run in part of it. 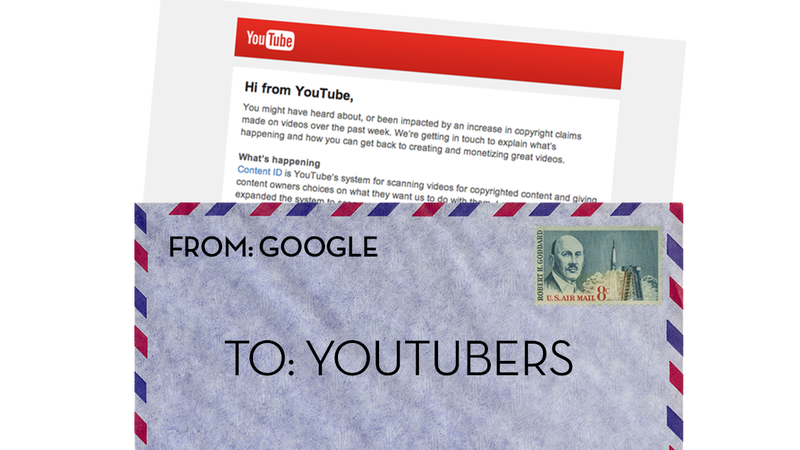 You might have heard about, or been impacted by an increase in copyright claims made on videos over the past week. We're getting in touch to explain what's happening and how you can get back to creating and monetizing great videos. Content ID is YouTube's system for scanning videos for copyrighted content and giving content owners choices on what they want us to do with them. Last week, we expanded the system to scan more channels, including those affiliated with a multi-channel network ("MCN"). As a result, some channels, including many gaming channels, saw claims appear against their videos from audio or video copyright holders. Keep in mind one video may contain multiple copyrighted works, any of which could potentially result in a claim. For example a record label may own music playing in the video (even in the background), a music distributor may own a game's soundtrack, or a game publisher may own in-game cinematic content. Also, online rights are often resold to companies like music labels and aggregators. While you might not recognize the owner, this doesn't necessarily mean their claims are invalid. When a claim is made, you'll see what's been claimed, who's claimed it, what type of claim it is (audio or video), and you can play back the part of your video that it matched. We want to make it as easy as possible for you to act on Content ID claims, and you can find out all your next steps, dispute options, and other troubleshooting resources here. It's also important to know that most claims won't impact your account standing. If you're creating videos with content from other people, remember that rights ownership can be complicated and different owners have different policies. Be aware of music. Many games allow you to turn off background music, while leaving sound effects enabled. And if you're looking for music you can freely use (and monetize! ), check out our Audio Library. Whether gaming, music or comedy is your passion, know that we love what you do. We've worked hard to design Content ID and other tools to give everyone — from individual creators to media companies — the opportunity to make great videos and earn money. As YouTube grows, we want to make sure we're providing the right product features to ensure that everyone continues to thrive. If you're coming in late to this, you should be aware that YouTube's sweeps have snagged a video showing a game that the uploader made from scratch. It's been fooled into diverting ad revenue to people who didn't actually have any copyright claim to the videos that got a Content ID match. Even as some game publishers are rallying to support gaming YouTubers, I hear from YouTubers every day who tell me that their videos are being matched, mostly by music licensing companies whose claims seem narrow and are proving altogether disruptive to the gaming YouTuber scene.